Mix ½ cup heavy whipping cream with ¼ cup buttermilk in a small bowl; cover with plastic wrap and allow to sit out on your counter for 3 days to culture and thicken; stir once a day. Store in the refrigerator. Mix all ingredients together in a bowl, except the Calm Specifics Kids, and refrigerate overnight to draw some of the juices out of the strawberries. Place refrigerated ingredients into a small saucepan, bring to a boil over medium-high heat and cook until large shiny bubbles form, stirring constantly. Boil about 10–15 minutes, until reduced and syrupy; you can test the readiness by placing a small drop on a frozen plate, then nudge it with your finger. If the jam wrinkles when you push it, then it is ready. Remove from the heat and allow to cool. Mix in 4 teaspoons Calm Specifics Kids and place in the fridge. You may need to add a pinch more sugar or honey to adjust for taste. 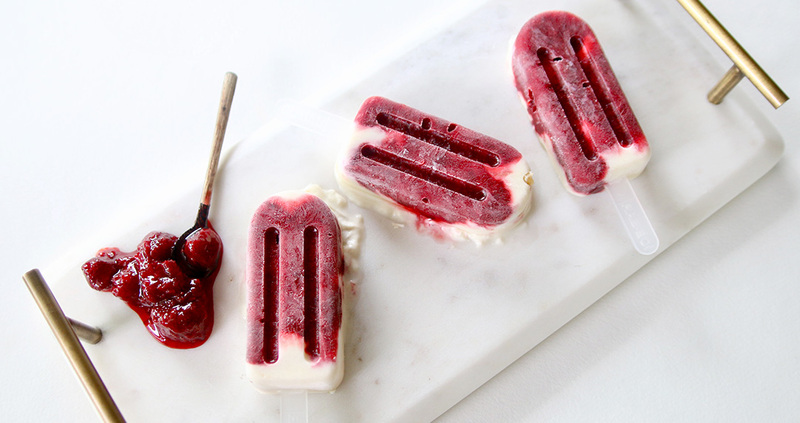 Scoop 1½ tablespoons of jam into your popsicle mold, then cover with another 2½ tablespoons or so of crème fraîche. Tap the mold on the counter to remove any air bubbles and allow the mix to gently fold on itself. Freeze overnight and enjoy!